The 24 Hours of Daytona—IMSA’s annual season-opening festival of utter vehicular masochism and pretty lights—is more alive than ever thanks to some big names and a deep field of cars. 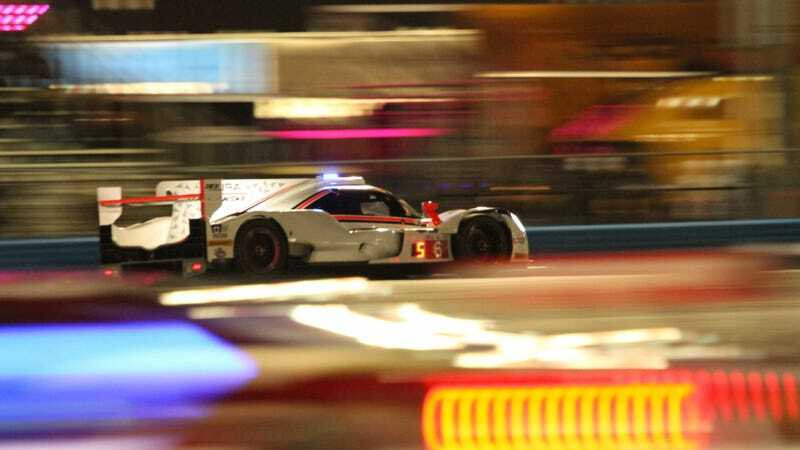 Not only did the infield sell out entirely, but the fastest prototypes are on pace to break the record number of laps ever driven at the Rolex 24. There’s a tremendous sense of optimism about this race and the series around it here that’s reflected in the numbers. While Daytona International Speedway representatives told Jalopnik that they do not release official attendance numbers, the infield parking and camping spots were sold out such that media and team parking is outside the grandstands for the first time in years. Speaking of the media, an IMSA representative said that they’ve approved 20 percent more media credentials—the fancy passes that allow media members into the press pit—than in regular years, from around 180 outlets here for the 24 Hours. A Daytona representative confirmed that over 500 individual media credentials had been approved. One IMSA official said that the media room is as packed as it gets for NASCAR’s Daytona 500, which is unheard of in recent years for the 24. IMSA officials expect this to be a record crowd for recent-year Rolex 24 attendance. While they credited Asian endurance überteam Jackie Chan DC Racing and two-time Formula One world champion Fernando Alonso for getting international attention on the series, and major IndyCar drivers like Juan Pablo Montoya and Helio Castroneves getting more racing fans to tune in, they also boasted about having three highly competitive classes that are packed with cars. It’s played out more as two competitive classes thanks to GTLM being dominated by the two Fords, but I’ve been entertained anyway. In a weird year where we’re not sure what is going to happen to Le Mans’ top prototype spec, IMSA’s mix of homegrown DPi-spec cars and international-spec LMP2s is thriving, with 20 cars entered—most of which were extremely competitive throughout the race. That big crowd will likely see something special go down in the final hours of this race. This year’s Rolex 24 has been oddly sparse on cautions, with long periods of green-flag racing allowing cars to crank out lap after lap after lap, so they’re on pace to break the record number of 762 laps ever driven in the race. With one hour and fifty-five minutes left, the leading No. 5 Cadillac DPi-V.R has done 736 laps already—so if you want to see a record smashed, tune in now. UPDATE [1:34 p.m. ET]: We’re also on track to break the distance record for the Rolex 24, which was 2,760.960 miles set in 1982. To break that, we’ll need 776 laps done and at the time of this update the leading car is already on lap 770. UPDATE [2:05 p.m. ET]: It’s official: we’ve broken both the record number of laps as well as the record number of miles done by the leading car in a Rolex 24.